It’s easy to become snow-blind when writing a business proposal, especially if you are performing more than one role in the team. 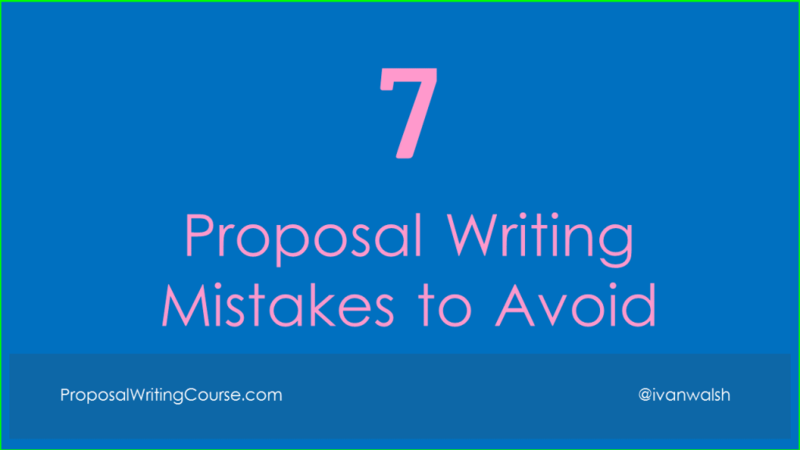 And if you’re new to proposal development, bidding, and grant applications that are many pitfalls to avoid. Some are predictable, others less so. Specific – Does your proposal clearly identify a specific problem – or set of needs – that you intend to address? Put yourself in the reader’s shoes. Will they understand from the opening sentence what you’re offering? Narrative – Don’t try to be all things to all people. Keep the narrative focussed and, if you are covering several areas, link the topics together so they dovetail into your message. Also, remember to tie together your executive summary and the closing summary. They’re two sides of the same coin. Transparent – If you are bidding for part of a larger piece of work, for example, the security aspect of a software system, highlight this upfront. Don’t try to hoodwink the evaluators by creating any type of ambiguity. Guidelines – Are you clear on the funder’s guidelines? In other words, make sure your bid isn’t disqualified by omitting a specific requirements, for example, the need to submit several hardcopies instead of one, or financial documents that must be submitted. Make Contact If you have read their guidelines and are still unsure, call them up and look for clarification. Don’t be shy. Your competitors are doing this as well. Support your claims. It’s not enough to say you can deliver a product or service. Give evidence to prove it. For example, if it’s technical, include the fact sheets and any independent assessments. Trash Talk – it’s not unusual to know who you’re up against, especially if you’ve been shortlisted or made presentations. And it can be tempting to highlight a weakness in their product or a project where they fell down. It’s very tempting. Don’t. Avoid making any derogatory remarks about competitors. It reduces you in the evaluator’s eyes. While this may seem obvious, when working on large projects, for example, where they are several writers contributing to the final document, make sure that none of them have spoken unprofessionally about your competitors. It’s something you made need to stress with younger team members or someone you suspect has a grudge against a competitors. And, of course, for legal reasons, it’s best to nip these comments in the bud.